Now you can buy the world's leading music and sound creation DAW without the need to buy Avid hardware. Take advantage of some of the most advanced tools to quickly and precisely edit tracks as well as 25 bonus plug-ins including compressors, limiters, reverbs and more. 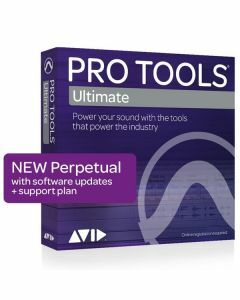 Pro Tools Ultimate (previously HD) is the go-to software for the entire range of audio apllications - mix, compose, record and edit all in one place. Whether you are in the music, film, TV or broadcast industry Pro Tools Ultimate can handle it all. Need Pro Tools for your post facility, broadcast enterprise, or educational institution? You can purchase a multi-seat Pro Tools or Pro Tools | Ultimate Network Site License, which offers many benefits for larger organizations.